According to the Journal of Spinal Cord Medicine, there are approximately 12,000 new spinal cord injury victims annually. These injuries can cause permanent damage, resulting in a lifetime of pain, suffering and disability. It is estimated that more than 270,000 people in the United States currently live with some degree of a spinal cord injury. The long-term effects of spinal cord injuries are staggering. They affect nearly every aspect of a person’s life, and in many cases, the lives of friends and family members as well. Due to the severity of these types of injuries, accident victims need a good law firm on their side from the start. An experienced personal injury lawyer can help accident victims recover the financial resources they need to move forward. Spinal cord injuries vary in nature depending on severity and location, with the location of the injury determining which parts of the body are affected. Injuries sustained near the top of the spine will cause more extensive damage than an injury to the lower back. A complete injury to the spinal cord will result in a total loss of sensation and paralysis below the injury, while a partial or incomplete injury to the spinal cord will result in partial loss of sensation and partial paralysis. Motor Vehicle Accidents – Almost 40% of spinal cord injuries are caused by motor vehicle accidents. Falls – 30% of spinal cord injuries are caused by a traumatic fall. Falls from trees, scaffolding, ladders, and stairs can all result in serious and permanent injury. Acts of Violence – 14.4% of spinal cord injuries are caused by violent acts like stabbings, gunshot wounds, and assault. Sporting Accidents – 9% of spinal cord injuries are caused by sporting or recreational activities including diving, horseback riding, trampoline accidents, and football. Miscellaneous – Spinal cord injuries can also be caused by machinery accidents, lightning strikes, animal attacks, and medical complications. 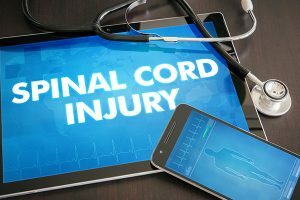 Spinal cord injury victims may find themselves confined to a wheelchair for the remainder of their lives. They may have difficulty talking, breathing, and performing basic care without assistance. They often need extensive care, long-term assistance, and costly medical equipment. This can be financially difficult for both the victim and their family members who may suddenly find themselves struggling to provide 24-hour care for their loved one. It is estimated that the average lifetime cost for a spinal cord injury victim can be as much as $4.5 million dollars. As the life expectancies for people with a spinal cord injury continues to increase, the amount needed to provide adequate care will also increase. If you or someone you love has sustained a spinal cord injury in an accident, it is important to understand your injury, as well as its long-term effects on the quality of your life. At Elissa I. Henry Law Firm, PLLC, our personal injury lawyers can help you through this difficult time. With offices conveniently located in Round Rock Texas, we are here for you when you need us the most. Call us today at (512) 766-4529 for a free consultation and review of your case.